Concerns about climate change have led to the modern-day debate around carbon emissions due to the widespread use of fossil fuels and other non-renewable energy sources to power our needs. One such need is air conditioning. So how were our ancient predecessors able to keep comfortable during hot summers without the benefit of electricity? 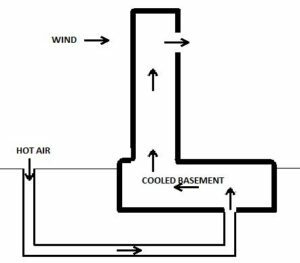 The earliest examples of air cooling technology date back to 4000 B.C. , in what we currently call Iran, where archaeologists have found evidence of the existence of an innovation known as the wind catcher, or wind tower. The ancient Egyptians have been known to use wind catchers as long ago as 1300 B.C. Wind towers were used to cool buildings, water cisterns, etc. throughout the Middle East and northern Africa since. 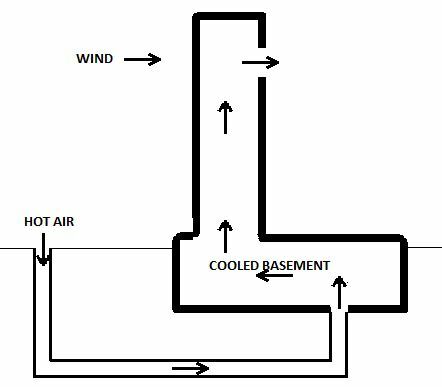 One wind catcher configuration is a chimney-like structure attached to the top of the building. The top of one or more of the sides of the tower has an opening that intercepts the wind, causing a downward draft of cool air into the building, while the hot air in the building is driven through another opening in the tower, or an opening located elsewhere. Abdolhamidi, Shervin. “An Ancient Engineering Feat That Harnessed the Wind” BBC Travel. September 27, 2018.